Why David and not Dorothy? AncestryDNA has taken the position from the very beginning that individual users of its DNA product don’t need certain information. We don’t, it contends, need to know what segments of DNA we might share with a person who is our match in the AncestryDNA system. And we don’t, it contends, need to know who else in the AncestryDNA database we and a match might have in common. AncestryDNA will tell us everything we need to know, it contends, by giving us DNA Circles. 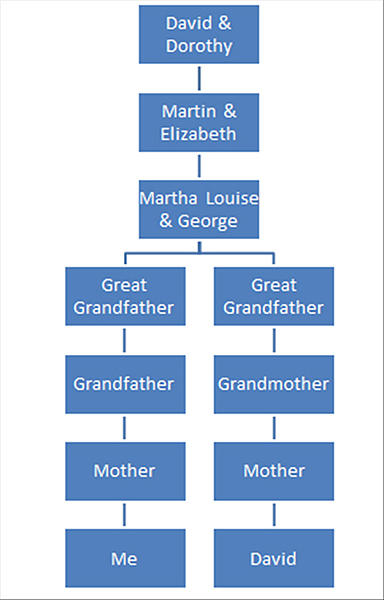 So why am I sitting here this morning, thoroughly frustrated and unable to figure out one simple question: how can a third cousin be in a DNA Circle for our both of our shared 3rd great grandparents and in a DNA Circle for our shared 4th great grandfather but not in a DNA Circle for our shared 4th great grandmother? Our mutual line of descent is shown in the graphic above. Both of us have Martin Baker and Elizabeth Buchanan as our third great grandparents, and David Baker and Dorothy Wiseman as our fourth great grandparents, and both of us have all of them in our Ancestry family trees. As for our shared fourth great grandmother, David’s Ancestry tree lists Dorothy as born 5 Feb 1765 probably in South Carolina and died 23 August 1855 in Bakersville NC. Her parents, he says, were William Wiseman and Mary Davenport. My Ancestry tree lists Dorothy as born 5 Feb 1765 probably in South Carolina and died 23 August 1855 in Bakersville NC. Her parents, my tree says, were William Wiseman and Mary Davenport. In other words, the tree data is exactly the same. That sameness shows up in the DNA Circles for our third great grandparents Martin and Elizabeth — everything matches. It gets wonky when we get to that fourth great grandparent generation. I have 17 people in my DNA Circle for David Baker and fewer for Dorothy Wiseman. That makes sense because David Baker had two wives, and some of those in the David Baker circle are descended from the first wife, Mary Webb, and not Dorothy, who was the second wife. That’s my third cousin David. And AncestryDNA gives me absolutely no idea why. I suppose it could be because cousin David matches me and some other members of the David Baker circle but not some of the other members of the Dorothy Wiseman circle. That could be, but I can’t tell, because AncestryDNA doesn’t give me a way to see who else cousin David and I have in common. I suppose it could be because cousin David matches me in a different segment than I match the members of the Dorothy Wiseman circle. That could be, but I can’t tell, because AncestryDNA doesn’t give me access to any of the segment data to make that kind of analysis. So cousin David and I are a match, and we both have the same descent from the third and fourth great grandparents, and I’m in circles for all four — and he’s in my circles for three of the four — and I have no idea why. So tell me, once again, why I don’t need those analytical tools, AncestryDNA. Because I can’t square these circles. Ancestry has a proprietary algorithm for determining whether two records refer to the same person (PersonRank, described in one of their white papers). It weights a number of factors, including names, vital statistics, and family relationships. In my case, I had not entered a complete family group for the missing ancestor (bad Ann!). She was included in the circle when I added her siblings to my pedigree. I have confirmed that the name need not be spelled exactly the same: Lidea Winters vs Lydia Winter did not break the circle. Other people have observed that spelling does make a difference in their case. Perhaps it’s just enough to meet some threshold for the PersonRank score. David’s information and mine match exactly, Ann, including parents. And we are in the 4th great grandfather’s circle together, just not his wife’s. I’ve come to accept that because AncestryDNA measures matches with mega base pairs, instead of cMs and SNPs like the genealogical community has come to expect, this is why they don’t show this type of information. They don’t have the information we want demonstrated. Even if they gave me match information based on mega base pairs, as an amateur genetic genealogist I would have no idea how to use that information. And because their target clientele is increasingly becoming people who don’t care one way or the other, that will probably never change. I wish I didn’t agree with you on the “never change” part. Yeah, I have to do a mass message soon to members of a couple of circles asking them to transfer to Gedmatch or Family Tree DNA because of the lack of data provided by Ancestry. I realized that two people from this family group match my grandfather way more than they should, which I believe might be a sign that there’s a double cousin relationship. Since they are from my grandfather’s maternal side and his paternal side which is a big huge brick wall is rumored to have followed a similar migration path, I need the numbers to know if it’s just an (enormous) anomaly with these two matches or if the trend holds true across most of the matches from this family group. Transferring is the only way to get really useful data. You may want to upload your Ancestry results to Gedmatch.com. I have found that they have wonderful tools and I found many matches there that I did not have on FTDNA. It takes a bit of time to upload the files and the Gedmatch.com servers seem to have problems regularly but it is well worth the trouble! Gedmatch also has some amazing Tier 1 Tools available for a small donation of $10 per month including chromosome browsers and triangulation tools. I’m in 22 DNA Circles. My 22 Circles have given me no end of heartburn. The biggest heartburn generator was coming from those little mini-biographies for each ancestor. Mercifully, Ancestry received enough negative feedback about the biographies to remove them from the DNA Circles. In my largest circle for a 4th great grandfather there are 34 people, 6 of whom I match dna with. Of those 6, I also share at least one entirely different set of ancestors, so am in other Circles with all 6…with one I am in 5 different Circles. Endogamy at its finest. I also have Circles for lone male ancestors with no Circle at all for the spouse. Switching topics just briefly…I am very uneasy about Ancestry’s upcoming roll out of its new web design. I signed up for the Beta trial but have not yet been selected. If those now deleted mini-biographies in DNA Circles are any indication of what’s coming with the “Life Stories” feature for our ancestors, my heartburn may only just be starting. I’m not happy with mini-stories either since they seem to pull from the most-repeated data, not the most-documented data. As an Aussie…I’ve got matches for fourth cousins with absolutely no idea how I match to these people. I look on with amazement & interest. Thanks for the information! Good luck getting some match info! Hope you get some… But they’re not all that useful really. Can’t you transfer the data to FTDNA? I’ve not tested with Ancestry (being a furriner n’at), but “people say” the best thing is Ancestry for the matches and transfer to FTDNA for the analysis. David (the match – if it’s the David I’m thinking about) has provided a different birth location for Dorothy than you and I do, but I doubt that’s the problem. He does have one of Mary Webb’s daughters attributed to Dorothy, which could be throwing off Ancestry’s algorithm. I suspect the real culprit might be in the lack of siblings for Dorothy in David’s tree. Plus, he has given Dorothy’s father a middle name and a different birth location. David’s birthplace for Dorothy’s father is Pennsylvania, while all of us in Dorothy’s circle have either William Wiseman born in England or no father at all. So, Ancestry has probably concluded that David’s Dorothy is someone different than our Dorothy. A bit frustrating, given that everywhere else on the site, the trend seems to be err on the side of inclusion rather than exclusion. In addition to the most common possible differences (spelling, middle names, date/place of birth), some people are using special characters attached to surnames in order to create a “breadcrumb trail” to/from specific ancestors. I have found that Ancestry does not consider “John Collins” and “John Collins *” to be equivalent. And meanwhile, ancestry.com employees are throwing draft cards into dumpsters at the St. Louis headquarters were they were hired to scan them and index them (one way to lighten the work load, I suppose), and their sales force is out in force telling every genealogical group eager to them them, say how DNA is the wave of the future for genealogy. Back at the ranch, they are busy compiling useless “Millenial Files” for marriages which are meainngless if we don’t don’t know the underlying record book it comes from…if you expecting ancestry to do anything other than “dumb down” the real world of serious research, you are in for a big disappointment. Oh, I could go on but it would be a waste of bandwidth. Craig Kilby…..I’ve been telling people for 20 years about Ancestry. Didn’t do a bit of good. Finally, people are beginning to find out for themselves. Thank God! The DNA Circles could be improved with a comments section to allow the members of each Circle to iron out issues such as these. I feel your pain, Judy. Circles has not only proven that it is unreliable (I have a situation similar to yours), but it gives me nothing that I didn’t already know. It is so frustrating, but I don’t think anything will change unless someone can find a financial incentive for Ancestry to finally produce a chromosome browser or a segment triangulation tool. That or a Miss America contestant answering the question, “What world problem would you like to see solved in your lifetime?” The answer: “I’d like to see world peace and oh,a chromosome browser on AncestryDNA.” I’m not holding my breath. I have been considering DNA testing. Have a family member with a definite lineage mystery. And would like to have my own done as well. Had come down to two tests 23andME or AncestryDNA. Pretty much decided on Ancestry until I read this blog today. Now it looks like 23andME may be the better choice. Or should I take a look at FTDNA and Gedmatch? Alison, notwithstanding AncestryDNA’s “quirks,” it’s still a good idea to test there because of the depth of their database (the number of people who have tested). My recommendations here still hold. Thank you, Judy. That was the main reason I had settled on using AncestryDNA (the number of people tested). And from there I can always transfer info to other databases. My family member with the lineage problem may be better served with 23andMe. He is not a member of ancestry.com and is looking for ethnic answers that look like they would be better answered through 23andMe. Sad that the data can’t be shared between the two sites. Thank you for helping shed light on a very complicated subject. I am going to do the AncestryDNA for myself. Then like you may become a DNA junky and try a few more tests. Just another aspect of my genealogy addiction! For the time being, yes, 23andMe does appear to be the best choice for the ethnicity estimates. But that’s not saying a whole lot, considering that ethnicity estimates at their best aren’t very good beyond the continental level. There is a question as to who my brother in law’s father is. The story is an man of Welsh decent who is on his birth certificate. However, there is a rumor that he may be the product of an illicit affair with a Jewish man. We would like to try and put the story to rest. 23andMe looks like the best test for that purpose. Either that or FTDNA (which probably would be the next bet and for YDNA testingif he does test out with Jewish ancestry, since there is a very deep Ashkenazi database at FTDNA). Really. Thank you. I will tell him about FTDNA. Thank you Judy for posting this. It is essential to test at Ancestry to participate in their huge database of matches. But, every time I have to suggest that to someone, it is with regret that I am voting with dollars for them to continue their policy. I do have to cajole any matches that look key to the search to transfer their raw data to gedmatch.com or to FTDNA so that I can work with the matches. I have seen many matches that are very wrong just on the basic matches list. I do not see the circles at this point as adoptees do not normally have public trees. There is no hope that Ancestry will see the light when all they are seeing is dollar signs. Diane, we all knew when we tested with AncestryDNA that it didn’t offer a chromosome browser or segment data. That doesn’t mean we aren’t frustrated and annoyed that the data isn’t as useful as we might like, just that we are getting what we were told we would get. Agreed, however they kept saying a chromosome browser was going to take some time and it was not until fairly recently that we discovered that it was not going to happen. AncestryDNA has offered every reason, or excuse, under the sun for why they weren’t going to do it right at that time, but I can’t remember a single time they ever said they definitely would do it at some time in the future. I suspect they think DNA Circles meets that promise completely, Jason. Of course. And they were only about 2 years late and a chromosome browser short.